Get Through Tight Turns in the 2018 Ford Transit Connect | Rhinebeck Ford Inc. Despite its large size and spacious cargo room, the 2018 Ford Transit Connect is built for easy maneuverability. The sought-after cargo van and passenger wagon is engineered to help you make tight turns and navigate difficult parking spaces. The van is available in two different wheelbases. The shorter option has a turning diameter of 31.6 feet curb to curb. The larger wheelbase has a slightly higher diameter of 40 feet. To ensure that you don't lose control during those turns, the van comes equipped with Curve Control. This technology will slow you down if it senses that you're moving too fast so that you can come out of the turn safely. You can find a van that meets your needs at the showroom at Rhinebeck Ford Inc. We're located in Rhinebeck, NY. 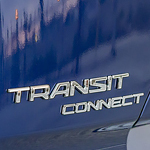 Our team is more than happy to give you a tour of the 2018 Ford Transit Connect and set you up for a test drive.